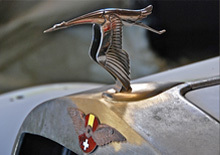 At Perfect Reflections we specialize in world class vintage automobile restorations. Our work is second to none, and our standards are the highest in the industry. Prior to starting each project, we perform extensive research and use our years of experience to determine originality in both fit and finish, for each car. We pride ourselves in repairing and replacing metal to its original shape and integrity, and we pay the same attention to detail in all mechanical aspects of the restoration for each client. We work closely with the finest mechanical experts available for each marque to insure accuracy and precision in our final product. Whether it is engine, suspension, wiring, gauges, or accessories that you need, we have the network to locate it for you. Should you need proper trim, mouldings, body panels or the like, we have metal and machine shop facilities in-house to fabricate them for you. If we cannot create a piece in our machine shop, we will utilize our vast network for locating rare and obsolete parts including glass, rubber, lighting, mechanical items, and more. 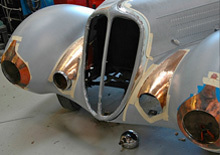 Our paint is what gives our finished product that 'Perfect Reflection'. At Perfect Reflections we put an enormous emphasis on color choice because we believe it is one of the most important aspects of a great restoration and, of course, the first thing you notice. In keeping with the skilled craftsmen of the time, only the finest materials and equipment are utilized when performing our paintwork. In fact, following the original craftsmen’s lead, we use only the proper hardware and appropriate plating, so that obtaining the correct patina for each project is virtually effortless. In addition, using our vast library of correct colors, we make it easy to come up with that perfect vintage color, or even match a sample or an original piece exactly, for you. 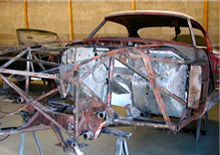 Restoring a car to us is not a job, it is our passion. Our goal at Perfect Reflections is to make sure that our restorations will perform and function as beautifully as they look. Because we share the love of the cars that our customers do, every car is an expression of our craftsmanship, commitment to excellence and the pride of knowing that it is the best it can be.